Film songs and patriotism on one hand, the diversification still was not enough. A good friend prodded her saying that along with her ‘paattu’ that has adorned many a heart, let her ‘pattu’ also embellish many a wardrobe. Thus began the story of Pothys and the ‘Parampara Pattu’! With some hesitation, Sudha decided to take the plunge and dabble with this new vista called ‘modelling’, doing it for two consecutive years. 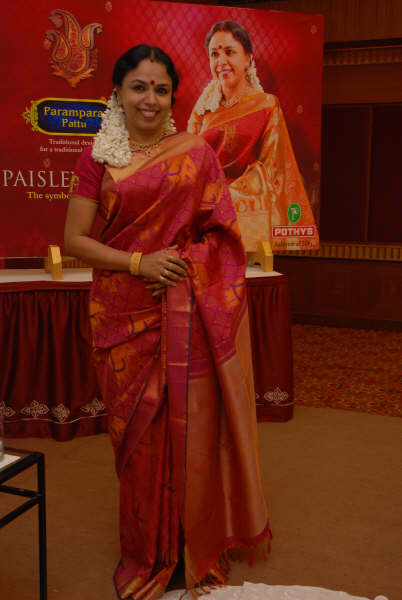 This was the theme for an eventful morning on 4th December,2008 at the GRT Grand Days Hotel – a press meet and an opportunity to interact with Sudha Ragunathan, arranged by Mr. Ramesh, Managing Director of Pothys, the silk barons. The brimming hall, filled with rasikas, well wishers, friends, fans and a host of press personnel, was all set to watch the morning unfold. The event began with an introduction by Mr. Gowrishankar on the Parampara silk saree and a presentation on the products of Pothys. This was followed by a screening of the ad film featuring Sudha. It was now Mr. Ramesh’s turn to address the audience and what a session it was! He unfurled some mind boggling incidents that happened during the shoot that quite stumped the audience. Some snippets from his disclosures….! The film was shot at Athirapalli Falls, some 30 kms from Cochin, Kerala. When Sudha was approached for doing the ad film the first time round, her first reaction was an emphatic ‘NO.’ Repeated follow up by Mr. Ramesh and Ms. Girija Raghavan, topped by some coaxing and cajoling, saw a very hesitant Sudha take her maiden step into the world of walking the ramp. Mr. Ramesh deliberated on the instances when there was an uproar from Sudha’s fans on the quality of the commercial, how he had to explain the different dimensions of the activity, why it was that Sudha, in particular, was chosen (apparently a market survey conducted by Pothys to identify who was the face that blended tradition, music and silk sarees had Sudha being rated as the topmost), what were the nuances that went into the making of the film, and finally the openness to all the feedback, which was worked upon and reflected in the subsequent episode of Aayiram Pookal. The second episode, again, had its share of appreciation and criticism. It was not an easy task managing Sudha’s well wishers and fans, while also focusing on the motive of the advertisement – mass reach and the commercial output. After all, a fair amount is spent on the ad film and it was only fair that the advertisers stand to gain. But then Mr. Ramesh had a great task at hand as he was dealing with an icon and a brand that is truly a representative of the pristine culture of the country, the sacred music of its heritage and who was a darling of the masses who savored her music. To quote Mr. Ramesh, ‘It was like treading on thin ice….and forever a tension that they had to undergo to ensure that the brand that was Sudha did not undergo any dilution from its core concentric essence of pristine music’! He went on to explain the making of the third episode at Athirapally Falls (along with some snapshots of how the crew and Sudha did some real trekking and balancing to get the right shots and the right moods). That was some ‘revealing’ indeed!! One got to see Sudha climbing precariously on a stool to reach the top of the rock, all in full Kanchipuram pattu gear, thambura and all. The next shot had her doing a balancing act, again in full gear, amidst the swirling waters and the rocks. There was an interesting episode quoted by the Director – how a water bottle stuck out like a sore thumb, in the running waters, getting in the way of a great shot. It went floating all over, refusing to allow itself to be picked up and discarded. The crew used long sticks and poles, trying to pull the bottle, which was playing truant in the pool of water just behind where Sudha was sitting, waiting to be shot. We guess the grit in Sudha came out full swing. After quietly observing the crew working hard on getting this elusive element out of the frame, she suddenly bent forward and snatched the bottle and threw it away….presence of mind, timeliness and the ‘never give up attitude’….all typical traits of Sudha….achieving things in her own quiet way….Well, she had the crew all agog,…..and of course, slightly sheepish. A member in the audience was so captivated by this description of Mr. Ramesh that he urged him to get that particular shot if it was filmed, and he would do a marketing gimmick with the owner of that mineral water manufacturer to whom the bottle belonged!!! Post Mr.Ramesh signing off came the most awaited session – the interaction. Commencing with her customary pleasantries, Sudha went on to give some insights into her perspective of how the commercial came by. With hesitation looming large, a thought process of ‘is this all required, when there are so many other people who are professionals in the field of advertising, when there is so much of work to be done in my own sphere….’. Sudha gives due credit to Mr. Ramesh’s perseverance and to her friend Girija Raghavan, who refused to take NO for an answer and went about very beautifully explaining how Sudha has it in her to bring both Pattu and Paattu to a larger audience as the media of advertising has such a wide global reach….and to top it all she was not doing anything that was not akin to her profession or to her stage presence. It was continued pursuance that finally led to Sudha’s acquiesce….and as Girija explained in private….”What a Herculean task it was”! Given the brand image, the fan foll owing and a set of protective friends, it simply was not easy handling this assignment. One had to be conscious of repercussions everywhere…the team virtually handled Sudha and this assignment with kid gloves. As though in final acceptance, the third episode was a great hit (not to discount the first and the second having its fair share of commercial viability). Everything worked in favor of Pothys – the learning from the earlier episodes, the location, Sudha’s continued committed involvement. One could see the pride in Mr. Ramesh when he viewed the screening along with the audience…Thus, as mentioned by him, it was in thanksgiving that he had arranged this session…a dedication to Sudha, her commitment and involvement in this project and her endorsement of his product, in all sincerity. It was truly a laudable moment where two professionals expressed great mutual respect and all humility, in front of the most important community – the audience, who were rasikas, fans, friends, well wishers, business partners, customers, critics – all rolled into one. Click on the link below for a flavour of the questions – to which Sudha has answered in her typical style – honest, open and from the heart.